The aeroshell forms a protective covering during the seven month voyage to Mars. The aeroshell, together with the lander and the rover, constitute what engineers call the "entry vehicle." 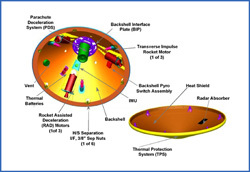 The aeroshell's main purpose is to protect the lander with the rover stowed safely inside from the intense heating of entry into the thin Martian atmosphere on landing day. The aeroshell for the Mars Exploration Rovers is based on the Mars Pathfinder and Mars Viking designs. The heat shield protects the lander and rover from the intense heat from entry into the Martian atmosphere and aerodynamically acts as the first "brake" for the spacecraft. What is the aeroshell made of? Built by the Lockheed Martin Astronautics Co. in Denver, CO., the aeroshell is made out of an aluminum honeycomb structure sandwiched between graphite-epoxy face sheets. The outside of the aeroshell is covered with a layer of phenolic honeycomb. A phenolic compound is made from benzene and is typically used in various plastics, disinfectants, and pharmaceuticals. This phenolic honeycomb is filled with an ablative material (also called an "ablator"), which dissipates heat generated by atmospheric friction. The ablator itself is a unique blend of cork wood, binder and many tiny silica glass spheres. It was invented for the heat shields flown on the Viking Mars lander missions in the 1970's. A similar technology was used in the first US manned space missions Mercury, Gemini and Apollo. It is specially formulated to react chemically with the Martian atmosphere during entry and essentially take heat away, leaving a hot wake of gas behind the vehicle. (Normal friction without an ablator would cause the heat shield to burn up.) The heat loss to the Martian atmosphere lowers the kinetic energy of the entry vehicle, thereby it slowing it down .... a lot.....fast! The vehicle slows from 10,000 mph to about 1000 mph in about a minute, producing about 10 "Earth gees" of acceleration on the lander and rover. Both the backshell and heat shield are made of the same materials, but the heat shield has a thicker (1/2 in) layer of the ablator. Also, instead of being painted, the backshell is covered with a very thin aluminized mylar blanket to protect it from the cold of deep space. The blanket vaporizes during Mars atmospheric entry.